Have you ever heard of the Miracle of Dunkirk? In May, 1940 Allied troops had been driven onto the beaches of Dunkirk by the Nazis and they were trapped. Essentially, they were waiting to be either destroyed or rescued. Thankfully, British civilians hurried to their aid, protected by fog and and calm conditions on the English Channel, which allowed hundreds of boats to cross to the beaches, pick up the trapped soldiers and bring them safely back across. It's an amazing story. There's another, less known, element to the story. While trapped on the beach, one British naval officer sent a three word message to London: "But if not." To many of us today, that message might not make much sense, but in 1940 people would have understood the reference. They would have understood an entire message from those three little words. The reference is to Daniel, chapter 3, when King Nebuchadnezzar decided to build himself a huge golden statue and then make everyone bow down and worship it. Anyone who refused to do so would be thrown into a fiery furnace. Three Hebrew young men did refuse and were brought to Nebuchadnezzar, who said (in Leanne paraphrase), "Is it true you're refusing my orders? I'll give you one more chance and if you don't obey you're going straight into the furnace" (vv. 14, 15a). And then, in the actual King James Version (which the British would have been using in 1940), "who is that God that shall deliver you out of my hands?" (v. 15b). The young men, named Shadrach, Meshach and Abednego answered, "If it be so, our God whom we serve is able to deliver us from the burning fiery furnace, and he will deliver us out of thine hand, O king. But if not, be it known unto thee, O king, that we will not serve thy gods, nor worship the golden image which thou hast set up" (vv. 17,18). Did you see the three little words in there? "O King", they said, "we know that our God can save us from you and everything you're threatening to do to us, but even if he doesn't rescue us, we still won't worship this statue." Like anyone else, these three young men probably wanted to live. They wanted God to rescue them. But even if they didn't get what they wanted, they were determined to continue serving Him right to the end. The British naval officer who sent the message to London was conveying that same determination to his superiors. "We want to be rescued, but if God doesn't send rescue, we're determined to keep fighting right to the end." What about us? There are times we want to be rescued too, or when we want someone we love to be rescued. We want rescue from sickness, especially from sickness that looks like it will soon lead to death. We want financial rescue. We want rescue in relationships. But what happens when we don't get the rescue we want? Well, if we're taking our cue from the Bible, from the example of those three young men, then we don't wait until the rescue doesn't come to decide our response. They decided ahead of time what their response would be. They knew God had the power to save them. There was no doubt in their minds of that. But they also knew that He might choose not to save them. That uncertainty, that possibility that rescue might not come, did not affect their response at all. Regardless of whether God saved them from Nebuchadnezzar, their faith would stay with Him. It is a fact of life that we will deal with situations we don't like. Whether we're looking to be rescued from someone in authority over us, from a situation where we feel trapped, from sickness or from something else entirely, we know that God has the power to rescue us. But that doesn't always mean that He will choose to rescue us. 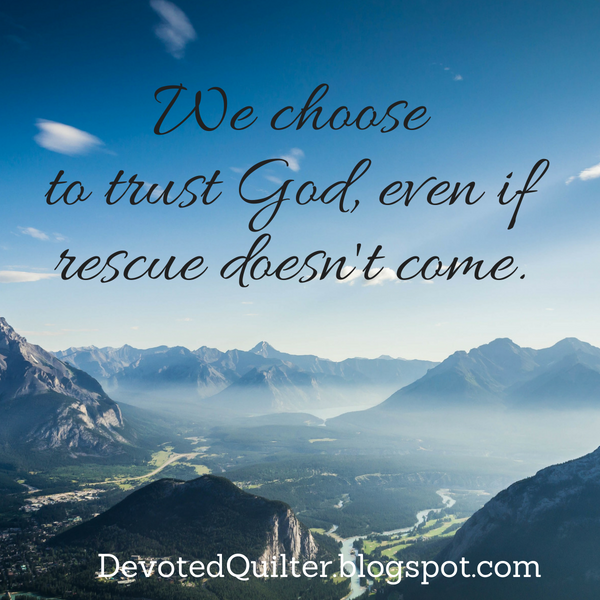 We can't know His plans or His reasons, but we can choose to trust Him whether the rescue comes or not. We're heading on a family vacation soon, so this will be my last devotion for a few weeks. I'll have a quilting post or two before we leave and then I'll be focusing on family time. I hope you are enjoying your summer! Great post. This is so full of truth thank you.